No matter what, I anticipate the summer’s arrival with equal measures of happiness and zeal. I plan each week significantly making sure not a single journey goes wasted. While filing the past couple of months pictures earlier today, I smiled and thought what a great job I did!! Pictures of relaxed family meals and get-togethers, cheerful wedding parties, fun-filled friends gathering and beach barbecues, carefree night clubbing, leisurely kids playdates and park visits and lots of family selfies! Well my favorite album is the one about the road trips we take during the weekends. Lebanon offers much to see. Our culture has been shaped over the years by a strategic location and intense historical events to spread worldwide and inspire so many. I try to show my kids the beauty that their seven thousands years old little country holds. Sadly, many of my friends and my children’s friends have been to Louvre but never to Beirut National Museum, where visitors can admire a world class collection ranging from Prehistory to the 19th century AD. 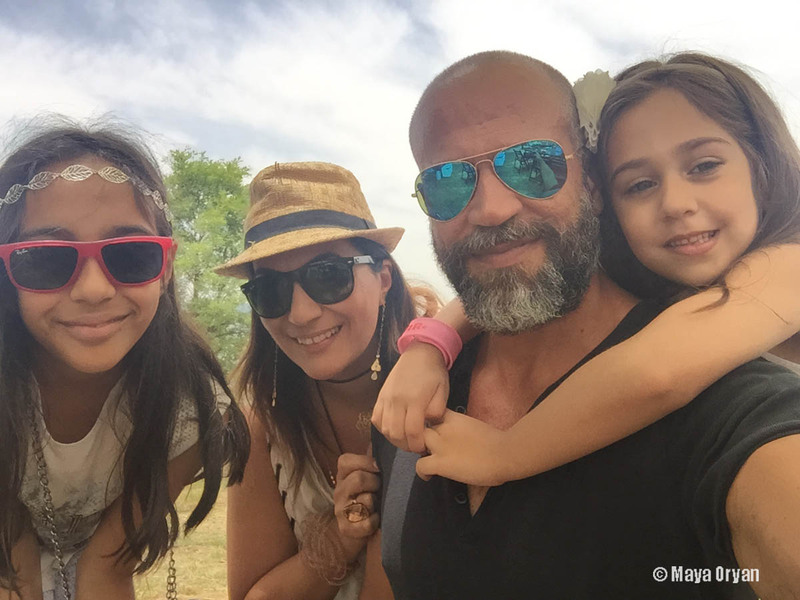 I sure want to travel the world with my daughters, but I also have a keen desire to show them as well all the Lebanese regions and traditions. And what is a better way than having this over a fabulous event and lots of traditional food. This year marked the 25th anniversary of Mymoune. 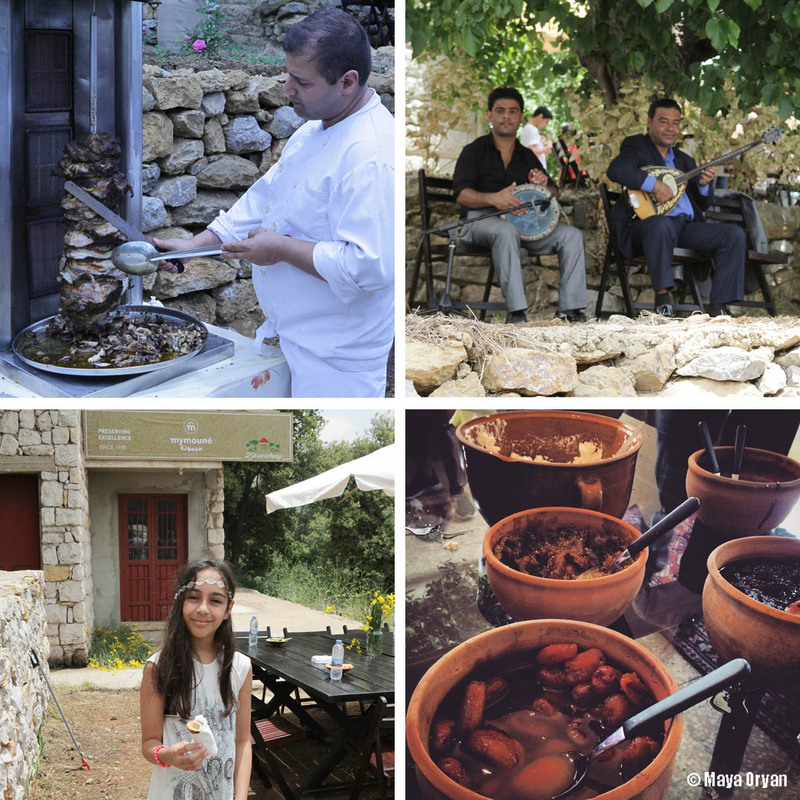 Mymoune produces all-natural specialties such as jams, preserves, syrups, seasonings, flower waters and other refined products made the traditional authentic way, in a small village called Ain-El-Kabou, at the foot of Mount Sannine in Lebanon and where the event was held. 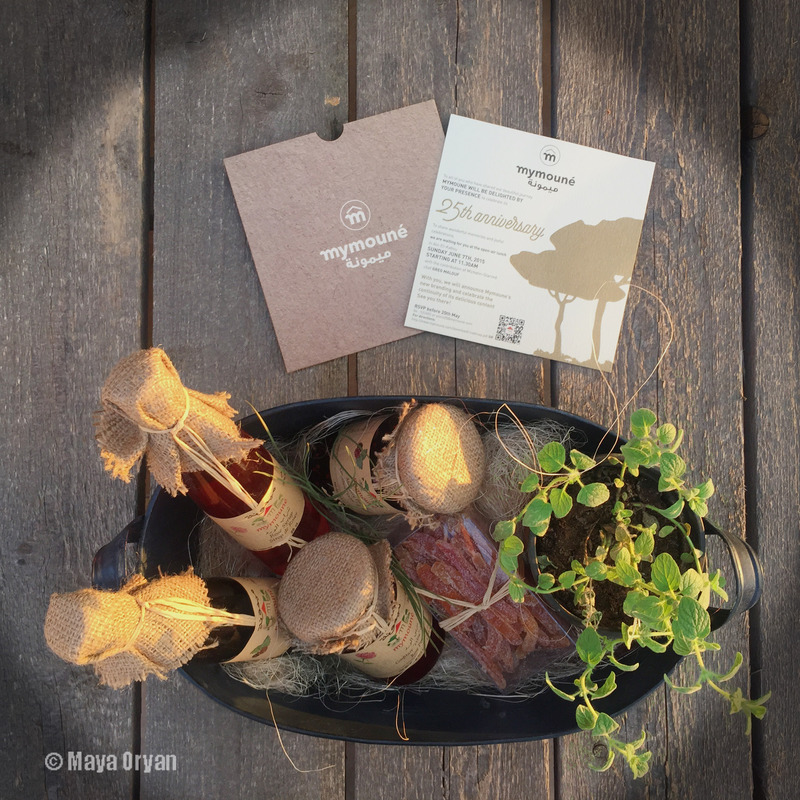 The invitation was sent in a beautiful hamper full of goodies from Mymoune and a thyme plant smelling like heaven. As soon as we arrived we were overwhelmed with a sumptuous outdoor venue, set in a fragrant garden surrounding an authentic Lebanese mansion where Mymoune has preserved a great history of Lebanese traditions. The stone house has an arch topped by a steep, red tiled roof, overlooking mountains and valleys. Tables were decorated with a centerpiece of seasonal yellow wildflowers (wezzal) and guests, were entertained by a live band playing local music. An array of traditional food was served, from bite size saj manakeesh, to lavish pork shawarma prepared by Michelin-starred chef Greg Malouf using Mymoune products. We drank Mymoune’s Mulberry Syrup & Arak cocktail, and finished it off with Lebanese style areesheh and candied pumpkin. Our host Amine Ghorayeb made sure we leave with another goody bag from Mymoune products that I placed fondly in my kitchen next to the rest of the range. 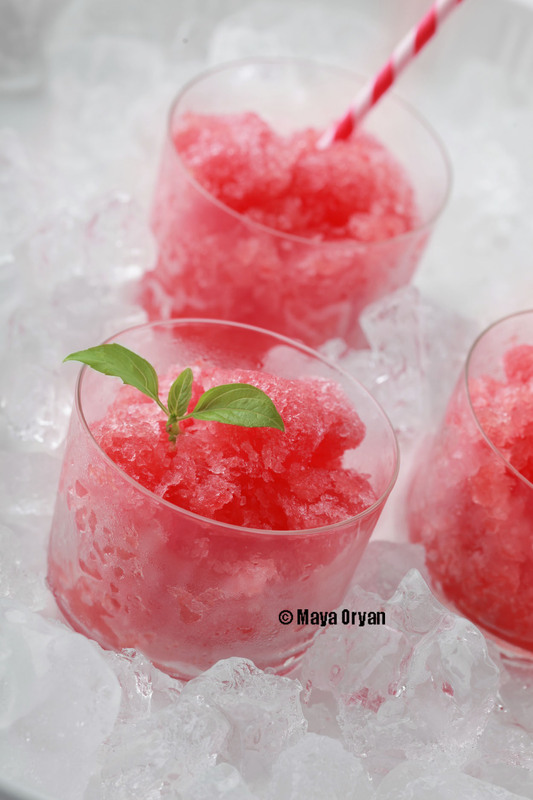 The ideal way to beat the heat this week was a watermelon granita using Mymoune orange blossom water. A fresh recipe and a fun bite worthy of most any celebration. I hope you love it! In a small saucepan, warm water over medium heat, add sugar and whisk until it has completely dissolved. Stir in lemon juice. Remove from heat and wait to cool. Process watermelon chunks in a blender to a slush. Mix in the sugar syrup and the orange blossom water. Pour into a shallow or a baking pan and freeze mixture for 1 hour. Rake mixture with fork and freeze for another hour. Repeat the procedure and freeze for one more hour. Scrape vigorously into icy chunks and serve immediately in individual cups garnished with mint leaves. This entry was posted in Desserts and tagged 25th anniversary, dessert, granita, greg malouf, ice, Lebanese Heritage, Lebanese tradition, lebanon, livelovelebanon, mint, mymounenatural, orange blossom, rural, slush, sugar syrup, watermelon granita by Maya Oryan. Bookmark the permalink.